It has been suggested that this article or section be merged into Avionics and instruments#Directional Gyro. 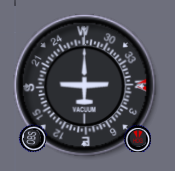 Heading bug on North, the red knob can rotate the bug across the compass rose. A bug is an indicator that can be moved to mark out something. The heading bug is an indicator on a compass rose to tell where to go to. It is often connected with the autopilot and, if enabled, the aircraft will fly the course of the heading bug. The heading bug looks a bit like a squashed ladybug. This page was last modified on 14 July 2015, at 08:07.